While we accept that most of today’s service and knowledge businesses are talent driven and that people are our biggest assets, organizations often struggle to develop and implement a holistic human capital management strategy that delivers on this belief. In fact, the current global hue-and-cry on talent shortfalls and high attrition rates in IT, BPO and other industries are only a tip of the iceberg. At the business level, there are imperatives like improving productivity, moving-up the value chain, enhancing competitiveness and getting closer to the customers. At the organization level, issues like managing a multi-cultural and multi-geography workforce, managing rapid growth, developing careers and creating “cool” work cultures continue to take a large mind-share of business leaders and HR professionals. It is not enough to just win the “Talent Wars”. Its also not enough to try HR/organizational solutions (like Business Process Reengineering, Employee Stock Options, Assessment Centers and 360-degre appraisals) in a piece-meal manner. Instead, the need of the hour is to take a holistic view of the organization’s business, culture, technology and talent needs. And adapt human capital solutions based on an integrated and proactive approach towards developing & engaging talent, growing the business and delighting the customers. 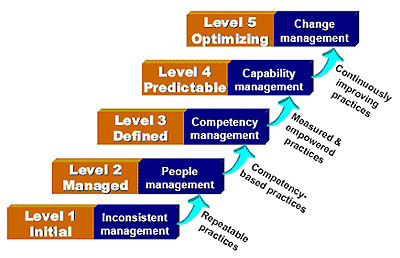 Each maturity level of the People CMM®, with the exception of the Initial Level, consists of three to seven Process Areas. Each Process Area (PA) identifies a cluster of related practices that, when performed collectively, achieve a set of goals considered important for enhancing workforce capability. The process areas at each level of maturity create an inter-linked system of processes that transform the organization’s capability for managing its workforce. The workshop deploys an effective mix of instructor-lead presentations/lectures, case-studies and team exercises by the participants. Participants are encouraged to discuss specific issues facing their organizations, and seek solutions from instructor and peer group. Reading homework is required the first and second evenings of the course.